Character: Unlike his brother, Suboshi is rude, stubborn, and careless. He really loves his brother, since they grow up together under such a difficult situation (civil war). He can do anything for his brother. Yui is another person whom Suboshi cares about because he loves her. 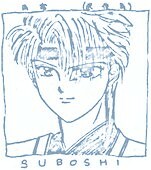 Due to this fact, he hates Miaka, and envies Tamahome.